Boy oh boy… do I have a challenge for you this month! We did this on The Crochet Cruise and it really challenged our crocheters… more than I thought it would. The biggest challenge with this shawl is the opportunity to read a crochet diagram and follow it along. But get this… there is a rhythm to the shawl and once you brain gets it… there’s no stopping you. In fact, I believe only 1 person finished on the ship… and we had some back to back crochet cruisers who spent 2 weeks with it. But let’s face it… it’s a crochet cruise where the conversations and fun interrupts them. I would describe this shawl as “Less Conversation and More Concentration!” Most of us crochet on our own anyway so people who bam this together in no time will question what the difficulty is. Others just may want to strangle me! But I will say this… you finish this bad boy… You are going to be very proud of yourself! Of course, with this challenge, you will be given everything I have possible to teach you. You will receive the free pattern, free crochet diagram and free video tutorial. One Person will be lucky enough to be randomly selected for a draw of fabulous yarns by Yarnspirations. All entries due by 11:00 pm ET, April 15, 2015. Complete this shawl as per the pattern from start to finish. The shawl is relatively small, you are welcome to increase its size to best fit your person who it is intended for. In fact, I highly recommend making it bigger as the original size will not fit most people. You can use any colours you wish. You can use any yarns you prefer to work with. You can substitute your crochet hook but you still must follow the pattern to be fair. The shawl should have 7 fans of rows by the time you are complete. How to Read A Crochet Diagram. How to recognize sequence in numbers to easily remember the pattern once you brain clicks into the pattern. Stitches learned will be the front post double crochet as it will cause the one row to lift outward for a unique look. If you don’t want to use Patons Glam Stripes, let me give you some other yarn brand ideas and the quantities you will need. You need a total of 1044 yards of yarn using a size H or 5 mm crochet hook. This pattern will work better as a solid colour and/or slowly transitioning colours of yarn. Colour changing is up to you to do as your own free creative choice. You are welcome to substitute your yarn with anything you have in stock as well. Each completed project you do is an entry. You are welcome to submit as many completed projects as you like. If your projects are all the same colour/design, you must take a group photo to prove there is a multiple as each hat qualifies as an entry. Suggested Yarn is Patons Glam however, you may substitute your yarn to make this project. Review the Patons Glam information on Yarnspirations.com to determine substitution if required. You can choose any colours you wish and you can mix and match your yarns. Project can be done in solid or mixed colours. There is no advance sign up required. The challenge is open to all fans of The Crochet Crowd. There are no restrictions of country of origin associated this challenge. The draw at the end is random to be fair to all challengers. There is no sign up required to participate. Complete the project and submit your photo when you are done. 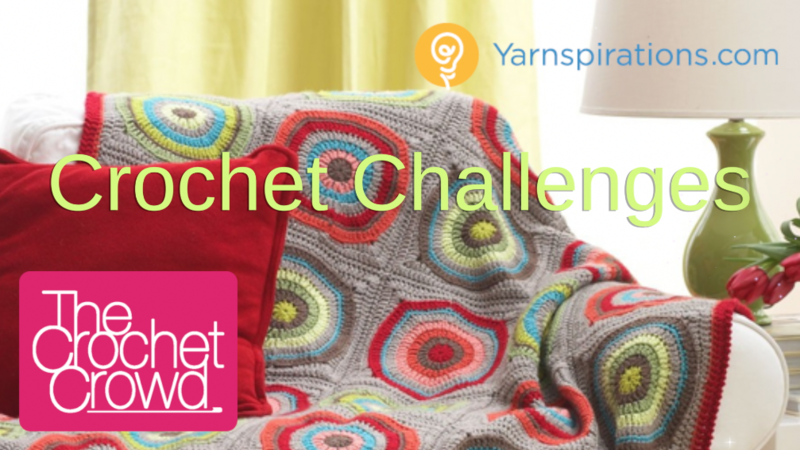 This challenge is open to fans of The Crochet Crowd. There are no restrictions of country origin associated to our challenges. You may do as many projects as you wish. Each submitted project is considered a separate entry. If multiple entries are identical, a picture showing the projects together to prove their are multiple must be included with your submissions. We require your photo to show the entire project so we know the entire project is done. The project photo must be showing all of the project for us to examine it’s completion. Ensure your project is completely finished with yarn tails and etc not showing. It’s like giving it out as a gift, we want to the see the photo showing as if you were gifting us the finished product. We will then know you are completely done. This is intended for a fun community challenge only. We each are deserving of the highest praise possible for our own creativity. Let’s have fun. Submitting for the Crochet Crowd Challenge is really easy. You must include your name and full mailing address to qualify. If you have forgotten to include your name and address in your email and have to resend, you must send in your photo again with your new email. Give us a 4 day window to review and enter your photo into our challenge. Do not resubmit. We do not acknowledge the arrivals of each email, but you may check our assigned gallery for this draw to ensure we have received it. The galleries are in alphabetical order by the name you gave us. To avoid your email from being misdirected and hitting our junk box. You must use the subject title. We are not responsible for emails that are misdirected as a result of a submission not following this procedure. To protect our servers, we delete any emails that arrive that have no subject title to prevent malware and virus programs from our systems. Please read challenge rules before submitting photo. Photo will be checked to verify it meets the challenge requirements. All photos must be submitted during the challenge time frame only to be eligible for the prize giveaways. Entries after this due date will be accepted for our gallery but there are no prize giveaways after the deadline. We are firm on deadlines and do not offer extensions to be fair to everyone who has submitted on time. When you email your finished photo to us, we respect your privacy and will only post your first and last name on the picture in our gallery with the photo so we can identify the winner at the end. Posting your photos to our Facebook Wall doesn’t count as an entry. You must send it to us in the form above for us to review. We may feature the submitted photos in our social media such as Facebook, newsletters and/or website. We will not switch the photo if you are unhappy with how it looks in the gallery, please ensure it’s the photo you definitely want featured is the only one sent. Your emails are kept on file for the duration of the challenge and then deleted afterwards. We do not add your email to our newsletter lists. Due to the countless technology platforms and services, we are not responsible for any of our challengers if a mobile devices or technology that isn’t compliant to being able to read our website, view our videos and/or get access to the free patterns. Please verify your entry is in our gallery prior to our draw. We need up to 3 days to get your entry into our gallery. We upload it ourselves as part of our review process. If you do not see your entry, we most likely haven’t received your email. Do not wait until after the draw to check if your entry is in. We are not responsible for any emails that are not delivered to us before the due date. 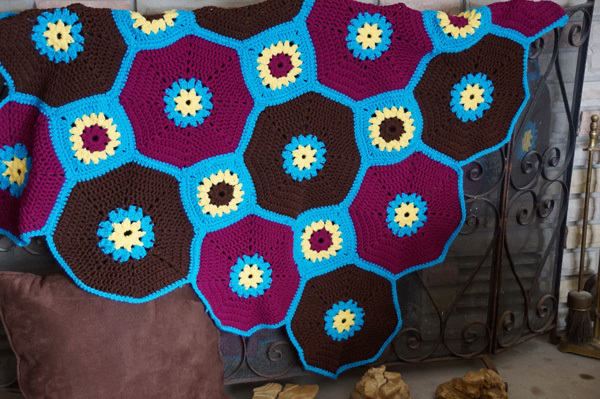 Show’n Tell: Post your finished project on The Crochet Crowd Facebook Page to show everyone your finished work so we can drool over your creativity. Featuring on Facebook is dependent on you. We do not upload your emailed photos to Facebook. You have to do that yourself if you want to Show N Tell your creativity. I’m almost finished with my first one. It was very hard to decide to do this, it looked hard, even though I’ve been crocheting for about 50 years, and I have to say that Mikey was right, you have to pay attention. I can’t tell you how many times I had to frog this thing, but between the written instructions, the diagram, and Mikey’s tutorial, I’m finally almost there and I just bought the most beautiful yarn to make another one with. 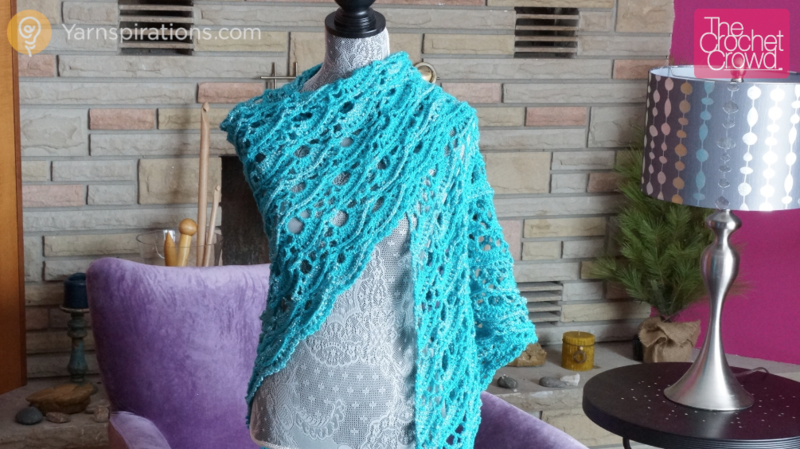 I have been looking at this shawl for a little while now as I thought it would make a nice Spring/Summer Shawl. Any particular reason why you didn’t use the Cotton-ish Yarn? Do you have a written pattern for the yes, yes shawl that you would share with me, please? i love this pattern! is there a way to make it a rectangle vs a triangle? 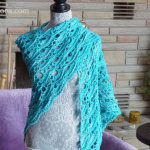 i would love to make one for my stepdaughter who is getting married and wants a shawl….a rectangle of course….lol.. thanks in advance for your answer! Where can I get the pattern for the poncho? Followed the diagram and mickeys video … Great success! Way too much yarn left over but will use it for something else . Thanks , my first diagram and Mickey made it easy for me.